Social scientists often focus on the share of people who believe in God as a barometer for religiosity. Yet, for salvation religions, a belief in the afterlife is also centrally important. What may be surprising to some is that significantly sized segments of Christians—including Catholics—believe in God but not in heaven and even fewer in hell. For someone who does not believe in an afterlife what does it matter if they only go to Mass on Christmas and Easter? How does sin matter at all? What is a saint? The table below shows results from the Pew Research Center’s most recent Religious Landscape Survey (2014). Among those self-identifying as Catholic, 97% say they believe in God but only 85% believe in heaven and 63% in hell. Similar “gaps” in belief are evident among Protestants, Mormons, Orthodox Christians, and Muslim Americans. Surprisingly, even nearly half of agnostics say they believe in God (46%) yet only 14% believe in heaven and 9% in hell. 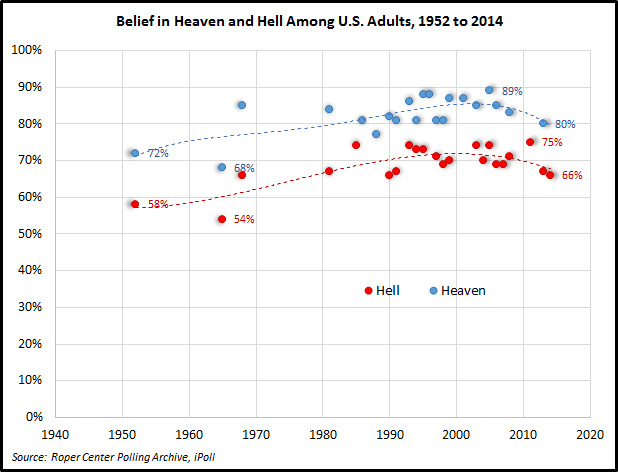 Oddly, if one looks at polling data from a historical perspective and among the total population belief in the afterlife, both heaven and hell, steadily increased from the 1950s to the 2000s. In only the last few years has belief in both begun to dip again. Still, more Americans believe in an afterlife now than they did decades ago (…another empirical reflection of the 1950s being no “golden age” for religion). There is one caveat to the data presented above. 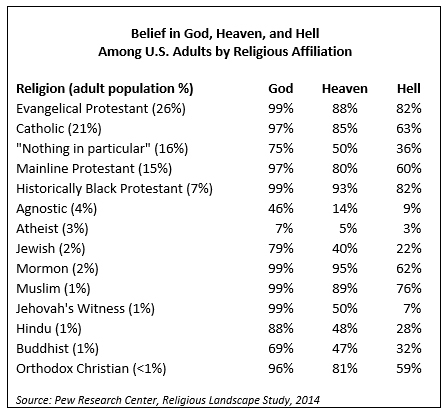 Even fewer Americans believe in heaven and hell if you try to describe those two places. For example, estimates of belief fall a bit when Pew describes hell as a place “where people who have led bad lives and die without being sorry are eternally punished.” Perhaps some feel hell isn’t this bad? There is one survey from 2010 that I could locate and study that combined the three possibilities of heaven, purgatory, or hell into one response. As shown below, nearly three in four Catholic adults agreed that these destinations are most likely where people go after dying (73%). Evangelical Christians were more likely to agree (91%) and those with no religious affiliation (aggregating “Nones,” agnostics, and atheists) were least likely to do so (27%). One of the few things Americans agree on, regardless of religious affiliation, is that we don’t “become ghosts” after we die. This is also somewhat odd as Gallup surveys indicate about 40% of American adults believe in ghosts! Maybe this is state of being only reserved for a few unlucky souls? 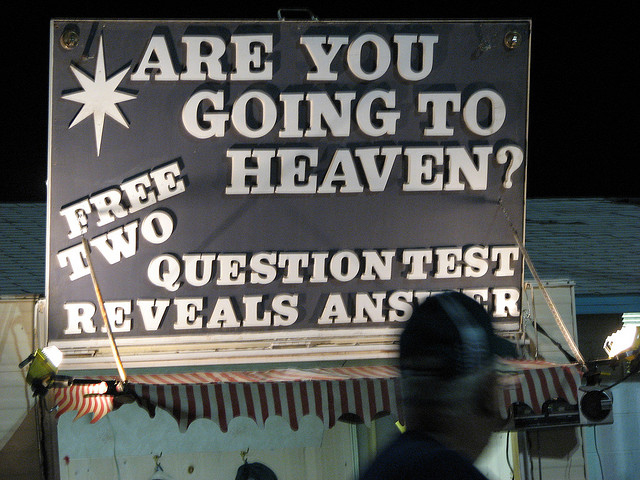 A CBS News survey from 2014 asked American adults who believed in heaven and hell (77% of their respondents), “At the end of your life, where do you think you are most likely to wind up—in heaven or in hell or neither one?” Eighty-two percent believe they are going to heaven and only 2% believe they are going to hell (16% said “neither” or they didn’t know). In 2012, a 60 Minutes/Vanity Fair poll asked respondents, “Assuming they both exist, which do you think is more important for the human race—Heaven, to reward the good, or Hell, to punish the evil?” Eighty percent said we need heaven more than hell. Ten percent chose hell, 4% said we need both equally and 5% didn’t know. Perhaps the best indicator of the future of belief in heaven and hell among U.S. Catholics is to look at what young Catholic parents believe today. After all their beliefs are likely to be passed on to their children. CARA recently surveyed self-identified Catholics, ages 25 to 45, who are currently parents to minor children. As shown below, about two-thirds believe in heaven and hell without doubt (65%). About one in ten believes in heaven without doubt but has doubts about or does not believe in hell (11%). 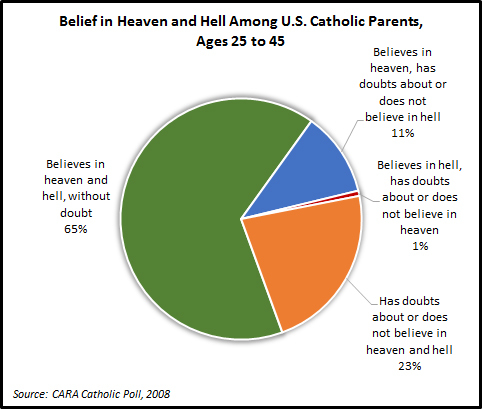 Nearly a quarter have doubts about or do not believe in both heaven and hell (23%). Although belief in heaven and hell now exceeds levels of belief of the more distant past, there is still this puzzling gap between American’s belief in God and their belief about what happens after life. We have examined before how this is correlated with frequency of Mass attendance and confession among Catholics. The lack of belief in an afterlife among some Catholics may represent a “soft” form of secularization—a segment that may be more likely to leave the faith in the future. A majority of Americans who do not believe in an afterlife have no religious affiliation (54%). One final piece of data. The General Social Survey has been asking a more generic afterlife question since the early 1970s. Rather than asking about heaven or hell or trying to describe these, it simply inquires, “Do you believe there is a life after death?” Here we can see something interesting. 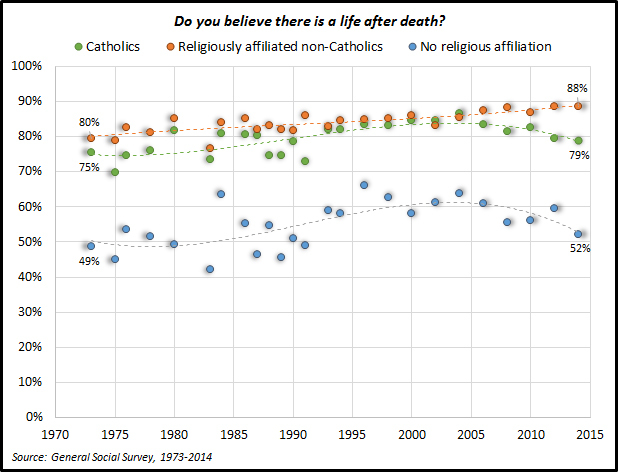 Among all religiously affiliated American adults who are not Catholic, belief in life after death is increasing slightly over time. Yet, among Catholics, the trend line has been sloping downward since 2010. 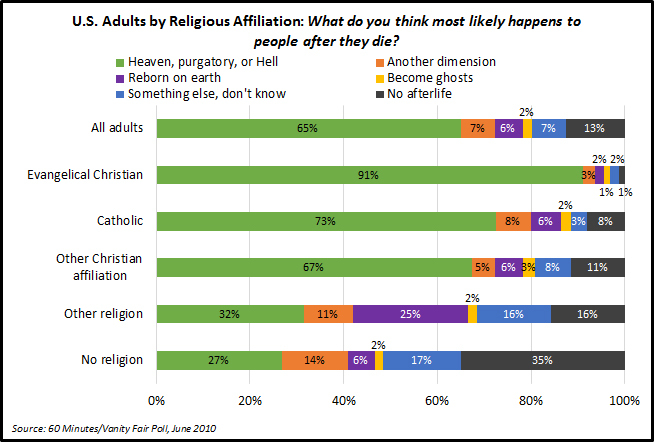 Religiously unaffiliated adults are also losing belief in an afterlife. Seventeenth century mathematician Blaise Pascal put the afterlife at the center of his “wager” and argument for belief in God. With eternal paradise or punishment on the line it makes sense to live a good life now given the inevitability of death. A rational person would have to be absolutely sure hell was not an option to do otherwise. If he were alive today I think Pascal would be puzzled by the number of American Christians who believe in God but not an afterlife. He’d also likely wonder a bit about the atheists and agnostics who believe in heaven. But then again, being dead he has already seen the payoff to his wager. My family came to know him through what he baked. Fr. 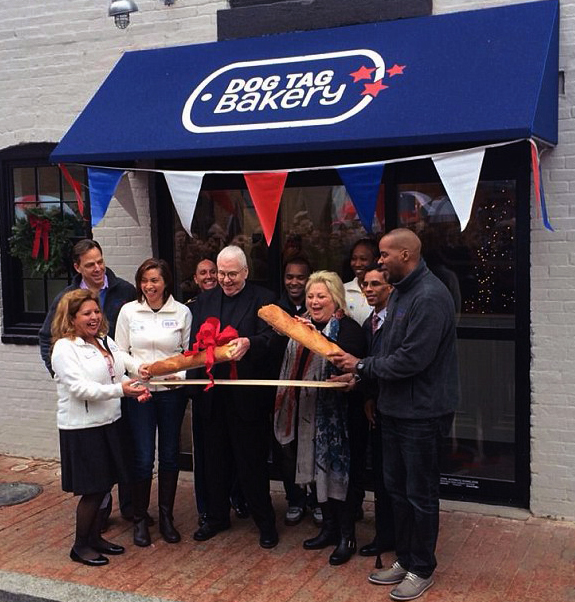 Curry created the Dog Tag Bakery in 2014. As a parent of kids with severe nut allergies it was such a blessing for us to find a bakery that is nut free. It is also a place where veterans and their spouses are employed and trained in business. The bakery provides fellowships that result in a Certificate in Business Administration from Georgetown. When I teach my course on the history and politics of food I require students to bake his recipe for “Brother’s Bread” from The Secrets of Jesuit Breadmaking to experience making something from scratch. It is always a highlight when they all bring in their version of the bread and share it in class. Fr. Curry was the founder and artistic director of the National Theatre Workshop of the Handicapped. You may have seen him act on television when he played Dr. Jonah Sorenson on Monk. He also developed the Writers’ Program for Wounded Warriors, which provides workshops where veterans tell their stories through monologues. It provides an opportunity for the development of writing skills, artistic expression, and therapy. Just last week at a Catholic Studies Christmas dinner we called Fr. Curry and each of the faculty wished him well as he received treatment and we all looked forward to his return. I let him know my kids had become huge fans of his chocolate cake. He told me I had to keep going to the bakery whenever they wanted it! And I will. A Virginia Catholic primary school (grades K-8) is going into orbit soon. Faith and science are striving to reach space from the hands and minds of Catholic school kids (with the help of Orbital ATK’s Cygnus Cargo Spacecraft carrying four tons of supplies). 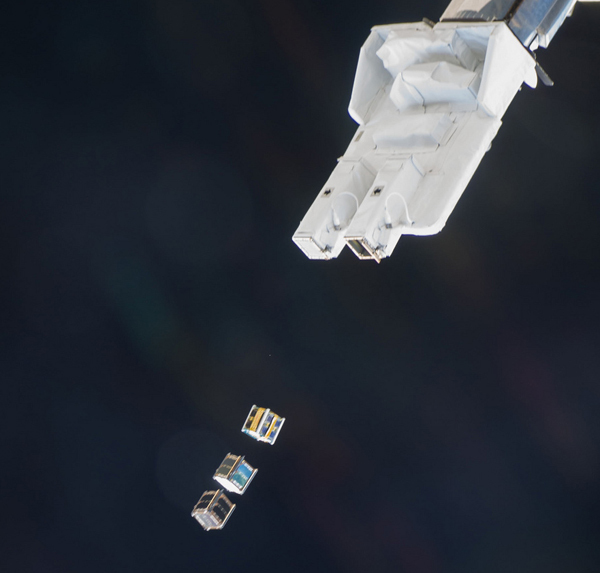 Students at St. Thomas More Cathedral School in Arlington designed, programmed, customized, and tested a four inch by four inch cube satellite (CubeSat) that is set to be released from the International Space Station (ISS). Launches on December 3rd and 4th were delayed by weather. A launch is expected before the end of Sunday. The idea for the project, the STMSat-1 Mission, came when America’s last operational manned spacecraft (for now) flew over the region’s skies on its way to the Smithsonian. Kids from the school formed the outline of a shuttle in the school parking lot as the Space Shuttle Discovery came to its new home in April 2012. The kids wanted the Discovery and the plane carrying it to see them. They began to think on a bigger scale and wondered about putting something in space that could not only look down but also up and out to the stars. The satellite cost about $50,000 and was paid for with fundraising and assistance from NASA. It includes an Earth observation camera and an asteroid observation camera. Unlike all other NASA satellites it also comes with a golden crucifix that was blessed by Pope Francis and a plate with the etched names of all the students and those who supported the project. Each grade has had its own responsibilities. 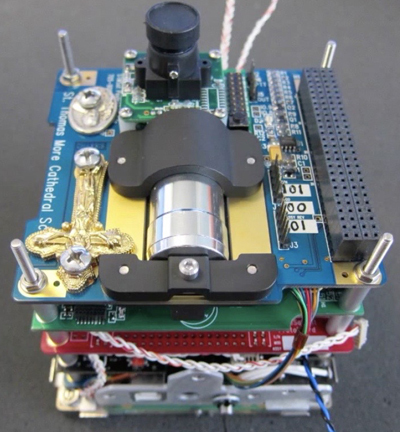 For example, the first graders are operating the ground station, the third grade is operating the asteroid detection camera, and the seventh grade worked on the satellite’s 3D compass payload. Outside of science classes, space has become integrated into other aspects of the school’s curriculum. “The art teacher has the students drawing planets, the music teacher has them making up space songs, the gym teacher has the children inventing space dances, and their religious instructor has the kids writing prayers for the satellite” (NASA). So often we hear about religious schools being criticized in secular media for integrating too much faith into the curriculum. Here we have a Catholic school widely integrating science. This may come as a surprise to many but it shouldn’t. Pope Leo XIII famously noted that “no real disagreement can exist between the theologian and the scientist, provided each keeps within his own limits.” The Church never opposed Darwin’s work on natural selection and in 1950 Pope Pius XII positively resolved that evolution is worthy of investigation for the source of the human body (...but not the soul...and of course Catholics can still favor the literal Genesis account). Generations of students have learned about evolution in biology and science classes in Catholic schools. In the 1920s and 1930s, Catholic priest and astronomer Georges Lemaître was instrumental in describing the creation of the universe with the Big Bang and the expansion that followed. Since 1936, many Nobel laureates (including Max Planck, Otto Hahn, and Niels Bohr) have served the Church in the Pontifical Academy of the Sciences. Current members include Stephen Hawking, Werner Arber, and Francis Collins. Yet this recent rich scientific history and legacy has never reached the consciousness of many. A 2014 poll conducted by the Pew Research Center, found that 36% of U.S. adult Catholics believe that science sometimes conflicts with their religious beliefs. By comparison, 34% of Protestants responded as such as did 16% of those without a religious affiliation. Even as most Catholics do not see conflicts between science and religion it is still distressing that more than a third of Catholics assume that there is. 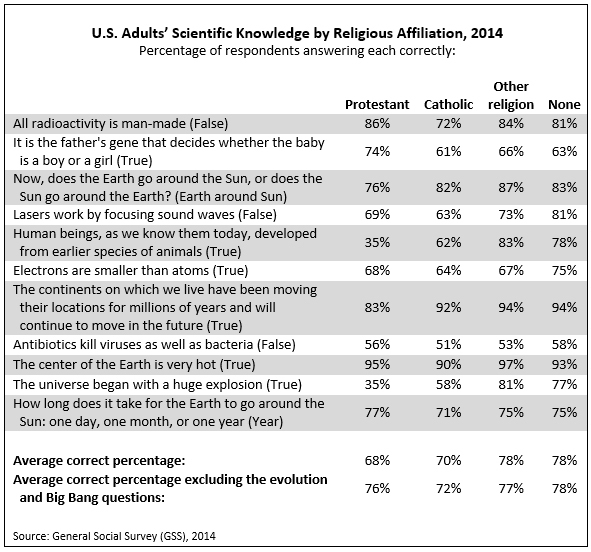 Equally troubling is the scientific knowledge U.S. Catholic adults express in surveys. The table below shows responses to 11 scientific knowledge questions in the 2014 General Social Survey (GSS). On average, only about seven in ten adult Catholics correctly answered these questions. More often than not being “outscored” by Protestants, those of other non-Christian religious affiliations, and those without a religious affiliation. I just finished teaching a class on secularization at Georgetown. One of the themes explored in the class was the growing number of young Americans who leave the faith they were raised in to adopt science as their new “faith.” Among those leaving Catholicism, many believe science is incompatible with the religion in which they were raised. I think the Church should continue to emphasize, perhaps as Pope Francis has with Laudato si', that the Church and science are by no means “at war.” I often think of science and theology as being on two parallel tracks seeking truth in different ways and searching for answers to different (but ultimately related) questions. Each may have to periodically correct course (i.e., the Church with Galileo or modern physics accepting “a day without a yesterday” as proposed by Lemaître). Perhaps somewhere in the distant future those two tracks will meet. After all as Pope Leo XIII noted “no real disagreement can exist.” Science also needs religion or some other ethical system. In the end it is just a tool or a process. It can tell you how to build a nuclear weapon but it can say nothing about how, if ever, this should be used. I hope Catholic schools not only continue to be great places to teach the Catholic faith but also strive to be world class centers for science, technology, math, and engineering (STEM) like St. Thomas More Cathedral School. Not only would this likely improve Catholics’ knowledge about science but also do much to counter New Atheism’s attempt to “claim” science as their own—as something apart from religion. Perhaps some of those Catholics leaving their faith for “science” would realize there have been little if any incompatibilities between the two for hundreds of years. Congratulations to the students and faculty of St. Thomas More Cathedral School and everyone at NASA that helped them. We hope all goes well. Godspeed, STMSat-1. 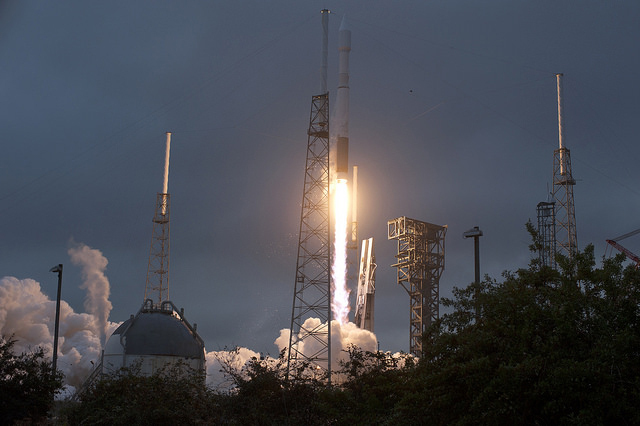 Update (12/6/15): The launch was successful (...on the feast day of Saint Nicholas)!